Filled with fun and entertaining activities to suit the needs of the class clown, the wallflower or the natural-born actor, The Jumbo Book of Drama will help kids discover and hone their dramatic abilities. 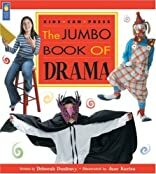 With 200 pages of theater games, plays, sample scripts, costume ideas, a glossary and more, this book provides all the inspiration they'll need to really get their act together! About Jane Kurisu (Illustrator) : Jane Kurisu is a published illustrator of children's books. Some of the published credits of Jane Kurisu include Junk Drawer Jewelry (Kids Can Do It), Alphabake, Easter Bunny, Are You For Real?.